Indian Air Force issued IAF HQ Maintenance Command Recruitment 2018-2019 Notification. And this time the advertisement is for 145 Group C Civilian Vacancies. Therefore, those people who are looking for the Jobs in Indian Air Force should take a look at all the details that are necessary to have. And do not worry if you are unaware of this IAF HQ Maintenance Command Recruitment 2018-2019. Because, here in this post, we are going to include all the mandatory information, for the sake of the job hunters. When you decide to apply for the IAF HQ Maintenance Command Openings 2018-2019, all the people should notice that there are some important dates, that the applicants must remember. According to the source in the advertisement, all the people can actually, start applying from 17th March 2018. And the closing date to submit the application form is 16th April 2018. Check further for info. Indian Air Force is one of the Reputed government Force in India and World. And now it is inviting applications from all the interested people, for the available vacancies. Therefore, those people who want to go into the Indian Air Force and want to serve the country should apply for this IAF HQ Maintenance Command Recruitment 2018-2019 on or before the closing date. So, in the official advertisement, the officials of Indian Air Force has asked the people, to possess certain Qualifications which the contenders need to have as of on time of applying. To provide the better resource for the applicants, here we are going to give information such as the Name of the organization, Number of Vacancies available, Starting date to apply, closing date to submit the application form, Age limit, Educational Qualification, Age Relaxation, Application Fee, Salary, Selection Process. Check further. Find all the important details arranged in the above table. We have tried to include all the mandatory information. Therefore, at first, we suggest the people, to check this table. And then proceed to verify other information. Now, all the contenders should notice that to apply for the 45 Group C Civilian Vacancies they need to have the correct qualifications. According to the information in the advertisement, the applicants need to finish either 10th class or 12th Class from any recognized institute or University in India as the Educational Qualification. Remember that having the correct qualification is very important. Because the officials of Indian Air Force will not consider your application form for IAF HQ Maintenance Command Recruitment 2018-2019. Many of you might be wondering how exactly to apply for the IAF HQ Maintenance Command Recruitment 2018-2019? do not worry. You can apply for the available vacancies by checking the official advertisement or this post. Now, after the educational Qualification, all the applicants should have awareness about the Age limit. While applying, all the people should know about the correct age. 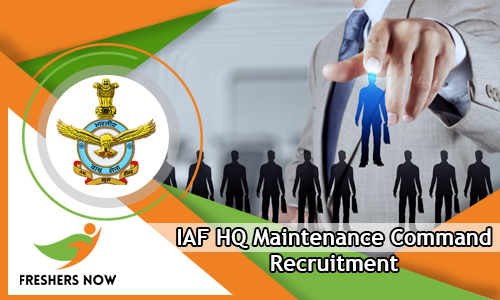 According to the data in the IAF HQ Maintenance Command Recruitment 2018-2019 Notification, the people who are applying for the IAF Group C Civilian Vacancies should have the Minimum age of 18 years while the maximum age of 25 years is acceptable. So, for age relaxation stuff, the Job hunters have to check the advertisement. For the sake of the contenders, at the end of this post, we are even attaching the advertisement. Click on it to download. Well, next important thing all the applicants should focus on knowing is application Fee. As per the source that is given in the IAF HQ Maintenance Command Recruitment 2018-2019 Notification, all the contenders must and should pay the Application Fee. If you check the notification clearly, there is no specification of application fee. Therefore, it is best for the contenders, to once again check the advertisement, for the details about the Application Fee. Take precautions while making the online payment. Soon after submitting the application form in the mentioned format, the officials of the Indian Air Force, are going to choose the contenders, for the Available Vacancies. And this will be done through by conducting some Recruitment Rounds. Apparently, all the people who are eligible and apply before the final date have to face those Recruitment Tests. Remember that the performance shown in those rounds are counted while hiring a candidate. As per the information in the IAF HQ Maintenance Command Recruitment 2018-2019 Notification, all the applicants have to face Written Test/ Skill Test. And performance in those rounds is taken into account while hiring an individual. So, try to do good in those rounds. Now, the selected people are going to get Rs.18,000 to Rs.63,200/-Per Month. And this payment will change for each and every position. So, better check the advertisement attached at the end of this post further for the Post Wise salary details. More other important information is given clearly in the next sections of this post. Rs.18,000 to Rs.63,900/- Per Month. This is the outline of salary. And will change for every position. Check the official site of Indian Air Force at www.indianairforce.nic.in. We hope that our team has provided all the necessary information about this new IAF HQ Maintenance Command Recruitment 2018-2019 Notification. For more such Fast Updates check Freshersnow.com regularly.